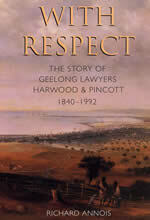 Richard Annois, With Respect: The Story of Geelong Lawyers Harwood & Pincott, 1840–1992, Thislot Press, Highton, Victoria, 2005. Richard Annois (left) signs Bernard Bongiorno's copy of With Respect at Geelong Art Gallery. The Hon. 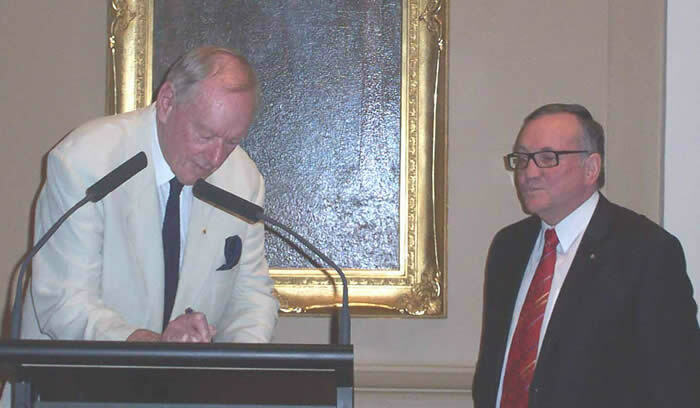 Justice Bernard D. Bongiorno launched Richard Annois, With Respect: The Story of Geelong Lawyers Harwood & Pincott, 1840–1992, Thislot Press, Highton, Victoria, 2005 at the Geelong Art Gallery on Thursday 2 February. The book is more than the history of a legal firm which has existed almost since the first European settlers arrived on the shores of Corio Bay. It is a large and entertaining slice of the social history of Geelong with lots of personal and family stories and not a few scandals revealed. The book was edited by Frances Hay of Sports and Editorial Services Australia and designed by Roy Walshe. The book is available from Griffiths book shop, Ryrie Street, Geelong, the Geelong Heritage Centre, Little Malop Street and the Law Institute book shop, 470 Bourke Street, Melbourne.